In the past years, sustainability has again become a theme in both academic and political discourses. Even though they often focus on green(ing) jobs and skills as recently emerged policy fields, also the different aspects of sustainable employment are increasingly receiving attention. 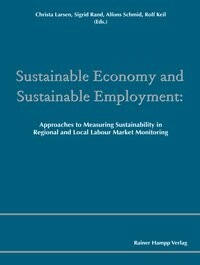 As the labour market observatories face the challenge of capturing the developments on the regional and local labour markets in regard to green jobs/skills and sustainable employment, the EN RLMM anthology seeks to clarify different conceptual and methodological issues with the aim to advance regional and local labour market monitoring efforts in this field. The publication focuses on monitoring approaches concerned with jobs and skills in the green(ing) sectors and sustainable employment on the level of European regions and localities. It is explored, how the above mentioned issues can be integrated in the continuously conducted regional and local labour market monitoring and how different stakeholders on the regional and local level can use the generated labour market data for their steering and strategy development activities.